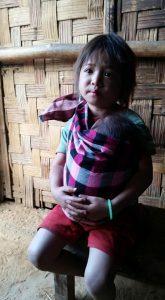 Lao Birthwork is a voluntary project that was inspired by having made several trips to Luang Prabang province in northern Laos between 2005 and 2015. 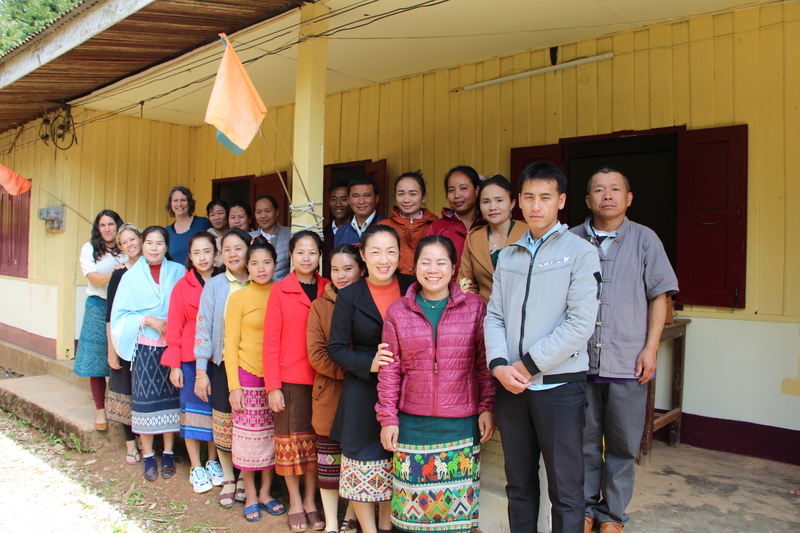 During my visits there, and through Laos contacts and friends working in Maternal and Child Health, I witnessed which services and training had and hadn’t been made available by the government and some of the established NGOs. 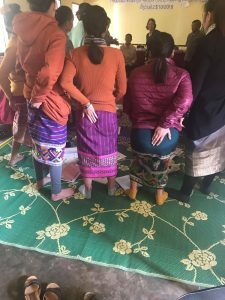 My interest really lay with wanting to understand more about the traditional systems of birth care and the ‘mortum yae’ – traditional birth attendants, and how they were supported. Where they exist, traditionally they come from a lineage of birth knowledge being passed from mother to daughter. Around 2005, I was fortunate to spend a little time with some ‘mortum yae’ in traditional villages. They hadn’t come from a lineage, but had some training as health workers for their village and then took on the role of attending births. This still happens sometimes, and sometimes it happens the other way around. Some mortum yae are trained as health workers. Even though the mortum yae have been valued til recently, the acknowledgement and support of traditional birth attendants within their own communities is no longer on the agenda of international aid agencies, and therefore no longer on the agenda of poor governments who rely on the aid agencies to channel money for establishing health services. Their preference and priority is to channel money and resources in to establishing a number of small clinics in each district and training health staff to work there. Clinic staff have to deal with all manner of medical problems, and also provide women and babies with antenatal, birth and postnatal care. The Laos government also supervises any excursions and trainings, so my dream of spending time with mortum yae in remote areas is not easily realized. When an invitation came to bring training to minimally trained and under-resourced ‘professional’ care providers, I graciously accepted. I then set about bringing together core team members – dear friends who were well experienced in hands on skills for complications, and also body-oriented skills for preventing and dealing with obstructions. Between the 4 of us we have experience in birth education, midwifery education, homebirth and hospital birth attendance, maternal and child health, bodywork, body-oriented birth skills and working with other cultures. For the last 4 years, 2016-2019, our team has raised funds for the project. We have to provide financially for every aspect of the venture, other than a vehicle which is provided for us. Each participant receives an allowance to enable them to travel, eat and stay close to the training. We provide each participant with a bag of essential supplies – nail brush, nail scissors, disposable gloves, scourers, cotton twine, torch, fetoscope, lubricant, tape measure, notepad, pens etc. And we take much needed supplies to give out such as infant bag/masks, dolls for education, posters and hot water bottles for comfort. We also buy blankets, pillows, towels, vinyl mats, basins, batteries and other essentials. 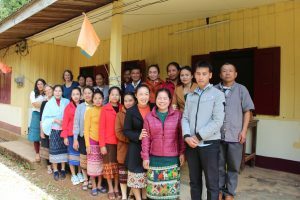 We teach in the remote district hospitals and health centres of Luang Prabang province, where the terrain is extremely mountainous, and roads and tracks to remote villages impassable in the wet season. 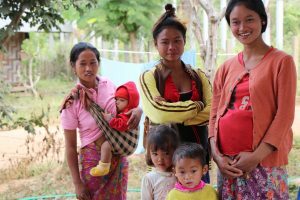 Though the population in Laos is less than 8 million there are 53 known ethnicities – with one estimate of over 100 ethnicities. Cultural beliefs and world views differ greatly between groups. A large number of villages are so remote that they are largely unreachable and not registered with the government. Apart from trade with neighboring villages, they are self- sustaining in their subsistence lifestyle. Many ethnicities have a distrust of modern medicine, and the cultural norm for them is to birth at home. Within some ethnic groups, restricted diets after birth can cause problems in the health of infants. Restricted diets may be based on poverty but also beliefs about the harm certain foods will do. It is only in the last 2 decades that Laos has been in recovery from the fallout of the Vietnam war, followed closely by the disruptive change to Communist government in 1975. During the Vietnam war, massive, widespread bombing occurred in the north with US army planes indiscriminately dropping leftover bombs into Laos territory after their bombing sorties in the mountains of Vietnam. 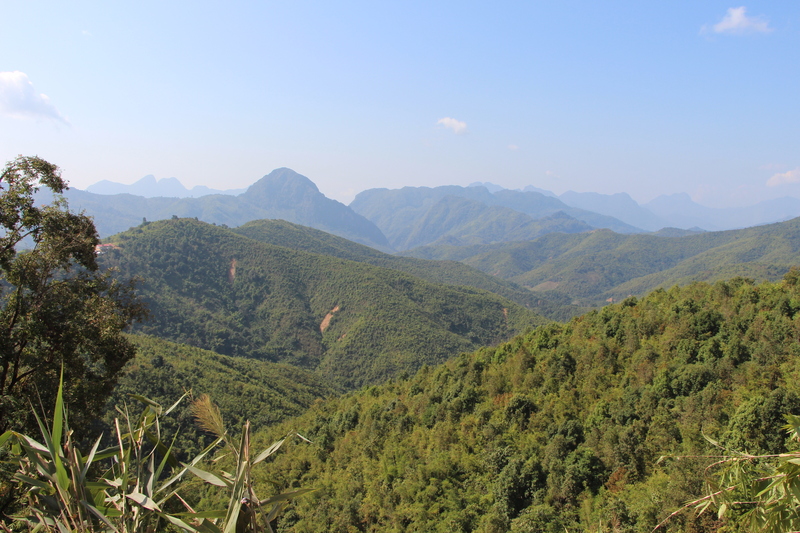 Consequently, Laos, who wasn’t part of the Vietnam war, is considered to be the most bombed country per capita in history, and mountain communities are still living and dealing with the threat and deadly legacy of UXO – unexploded ordinances. There was also great fracturing of Hmong mountain communities during The American Secret War against communist rule when the CIA, on the side of the royalists, enlisted the Hmong to fight for their interests. 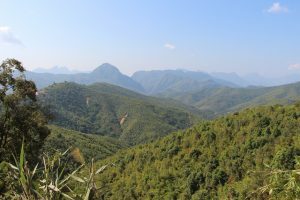 The fiercely independent Hmong had innate warrior capabilities and didn’t want political change either, just as most independent mountain people around the world feel about bending to political will. After the war, they were persecuted by their own government, and inadequately supported by the departed Americans. Many became refugees, with some still in the process of being repatriated. 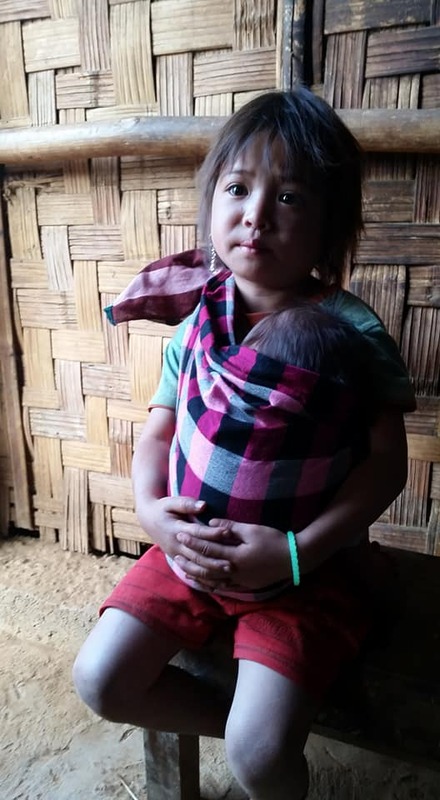 And in post war and economically poor Laos, some of the making amends to such devastation came in the form of global ideals and global aid to improve the high maternal and infant mortality rates so common in impoverished countries. The focus has been on establishing small health clinics with trained staff that provide maternity services, and encouraging everyone to access them. Seeking to bring everyone in to this clinical orbit is a huge task, if not an impossible one that is trying to be accomplished through the constantly shifting sands of international aid organization targets, assessments, ideals and priorities. The style and content of our trainings tends to be somewhere between where the clinical model and training ends, and the traditional model begins. We bring our 3 days of ‘hands-on skills for birth’ training to a central gathering of midwives, doctors, nurses and health workers (who are living in some of the most remote villages). This is appreciated as there is very little training that actually goes out to the districts and brings all the health staff together, so that they are connecting and learning together. This is presented as a logical imperative to better outcomes. 1. Be kind to each other. Share information at every opportunity to those in your community. When people are educated about birth and their bodies, woman and babies and communities are healthier. 2. Be kind to the mother. Her job is the most important job in the world. It is more important than your job. Treat every woman as though she were a dear sister to you, even if you have judgments towards her. When you are kind with your touch, your words and your actions, the mother will relax and she will birth more easily. whatever happens, the mother and her family will remember the kindness. 3. Be kind to yourself. Be prepared for any situation. Ask for help if you need it. Have your backup plans and transport plans in place. Rest well, eat well, sleep well. Poverty and challenging access to medical care remain the biggest health threats to women and babies and communities in general. We heard stories and sometimes saw for ourselves women who had walked for 6 hours to reach help at a clinic in pregnancy or during or after birth. And then were transferred by boat or by tractor or ambulance on dangerous roads for another 4 hours to a small district hospital. Once the promise of medical care is available to even the remotest communities, they will come, but usually when all else has failed. Birth in the clinics and district hospitals is still estimated to be at about 30%. The rest are homebirths. Transport when it is available and necessary, is often costly and can further impoverish families that live at subsistence level. Sometimes, especially during the wet season, transport is impossible. Women in Laos generally birth quickly. A first time mother is expected to deliver in 4 hours. Subsequent births are expected to be shorter. Unless truly needed, transporting in labour on bumpy dangerous roads by scooter, tak tak (tractor type of trailer), or even by car, can be a danger in itself. The ideal of having all women access antenatal care and birth at the clinics is fraught with so many logistical challenges. At the most, regular antenatal care can help identify some predictable problems and ensure the mother is referred for more complex medical care, but it won’t identify the unpredictable incidences of haemorrhage, premature birth, babies who need resuscitation, babies who get stuck, and surprise breech and multiple births. This is where we come in. Our aim with the training is to replenish confidence and morale and skills. And to also plant and nurture seeds that will grow natural birthing knowledge and wisdom that can easily flourish in any environment, conditions and circumstance. At the last training we did, in a very remote district, they had never had anyone come to do any kind of refresher training around birth. None of the 30 participants – who were health workers, midwives and nurses had received any training in newborn resuscitation, shoulder dystocia or breech birth. They were working in isolated clinics, under difficult conditions with very limited resources, and responsible for a number of outlying villages in their area. We spend time visiting some of those outreach clinics, refreshing emergency skills to staff and inviting village women along too for discussion and demonstrations. We show the clinic staff how they can accommodate women who prefer to birth in more traditional positions other than on their backs. We also encourage community information days, so that women and men can come together and ask questions, and share information about all aspects of birth. We’ve developed posters and a pictorial booklet to illustrate the aspects of what we teach. We are learning so much about this gentle culture, and about the politics of international development. We are learning more about the obscene imbalance of wealth, power and resources in a world that spends inordinate amounts of money on weapons and a relatively miniscule amount on ensuring the wellbeing of mothers and babies. And we are reminded about how birth is still largely and naturally successful even without the medical care for emergencies that we so easily take for granted in our wealthy culture. And how it can be even more successful when knowledge is freely shared. And we are witnessing how women still wish to have choice, all things considered, around where and with whom they will birth.